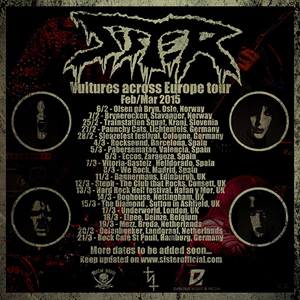 Swedish Hard Rockers SISTER have just confirmed a headline run through Europe in February and March of 2015. The shows begin on February 6th in Oslo and wrap up in Hamburg on March 21st! Follow facebook.com/sisterband for updates and details. Comments the band: "This is the first European headline tour we do in a while after heavily touring Europe as a support to a lot of great bands the last 3-4 years. We're really looking forward to playing whole sets every night and going through all the material we have on our three releases from the EP Deadboys Making Noise to the latest album Disguised Vultures. Will be killer nights for sure! See you out there!"